Accentuate the aura of your place with some stunning acquisitions. 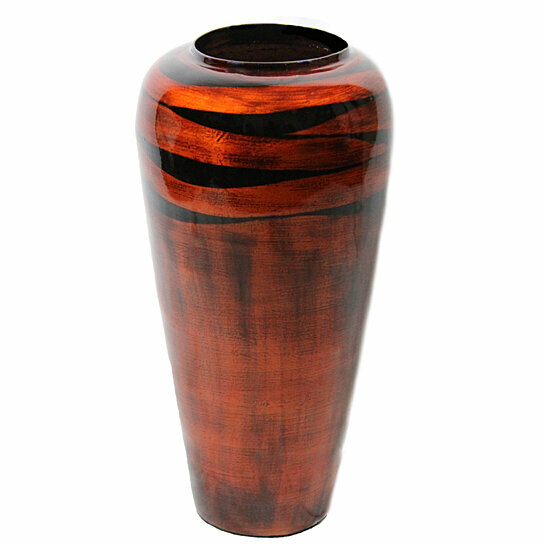 Simply breathtaking in every aspect this vase is a magnificent home decor that can either be adorned with floral stems or can be left as it is to instill a magical effect in your abode. Made from bamboo and lacquer it presents before you an exemplary of remarkable craftsmanship. It bears a circular opening at the top and flaunts a wide upper section which gradually becomes narrow at the base. Available in orange shade it can complement any interiors with perfect ease. Your bookshelf, table besides your couch or your bedside table can find a charming decor in this vase. Anyone stepping inside your abode will certainly notice your aesthetic taste if such alluring home decors are a part of your interiors. Gifting it to your close ones will make them amazed of your choice.